Do you need a feminist book in your life right now? Do you want a book that is both hilarious and powerful? Do you want a book about a girl who doesn’t take “no” for an answer? Do you want a book about a girl who takes on the patriarchy? Do you want a book about a girl who is as clever as Hermione, but can prank like Fred and George? This is the book that women all over the country need right now. I need it right now. I plan to re-read it promptly. Because I so desperately need a laugh, but I also want to feel empowered. No longer the kind of girl to take “no” for an answer. Especially when “no” means she’s excluded from her boyfriend’s all-male secret society. Not when her ex-boyfriend shows up in the strangest of places. Not when she knows she’s smarter than any of them. When she knows Matthew’s lying to her. Who would be interested in doing a read-along of this book? Live discussion? Yes?! I am thinking the two weeks leading up to Election Day. Who’s in?? Comment below if you’re interested! Merida refuses to be wed off to one of three heirs to Scottish clans, and searches for a way to change her fate. Pixar had to upgrade their software to handle Merida’s hair and the clothing details in the film. Merida’s hair is pretty breathtaking. I totally wanted to dye my hair red and get a perm. (Wonder if that will become a trend?) The Scottish landscape, castle, and magical forest were beautiful to behold. One reviewer claimed Brave’s animation “appears neither better nor worse than Madagascar 3 or The Lorax.” (link) I disagree, and with a brother who specializes in 3D animation, I can see the difference in the level of detail, environment texture, use of light and shadows, and overall character design. Brave is far superior in animation to films like Madagascar 3 or The Lorax and anyone who says otherwise clearly does not have a knowledge of the craft. Merida is at battle with her mother over following traditions, accepting female gender roles, and submitting to an arranged marriage. I thought this was a very organic conflict for the time period the film was set in, and yet still very poignant for today’s girls. As a female in today’s world, I still experience conflict over how a female is expected to act and how to get what I want. For example, I still feel like being sweet and compliant are traits expected from women, whereas confidence, assertiveness, and intelligence can get you labeled a cold b***h. One male reviewer cites Brave had a “superficial girl-empowerment theme.” (link) I take offense to that, and calling a movie that empowers women ‘superficial’ is sexist, especially when this is the first time Pixar has tackled women’s issues and what could be a risky move for them in a male-driven movie market. I admired how Pixar handled the resolution to the conflict. The mother represented traditional female values whereas Merida represented a more aggressive and assertive modern woman. In the resolution, in order to break the spell cast on her mother, Merida had to use a blend of traditional and modern. Merida had to sew a tapestry (domestic and traditional) as well as fight with arrow and sword (aggressive and modern). I thought Pixar put a lot of thought into the women’s issues in the film and it gave the film a depth we haven’t seen in princess animated narratives. Our theater was wild with laughter from children to adults, girls to boys. Parts of the movie were pretty scary and dramatic, so the humor was definitely necessary. Most of the humor came from Merida’s brothers, the scheming and cake-loving triplets. They were hilarious and adorable in their hijinks and mannerisms. Another source of comedic relief were Merida’s suitors. I particularly liked one suitor who spoke so incoherently that no one could understand him. Merida’s mother also got several laughs from the audience, though I’ll refrain from giving away any plot spoilers. The wisps, kilts, clans, bear lore, Scottish accents, tapestries, and other bits of Celtic culture gave this fairy tale a fresh feel. It is a culture that hasn’t been explored in any recent animated feature films and was a welcome addition to the movie. The bears were quite scary and probably the reason that this animated feature has a PG rating instead of a G rating. 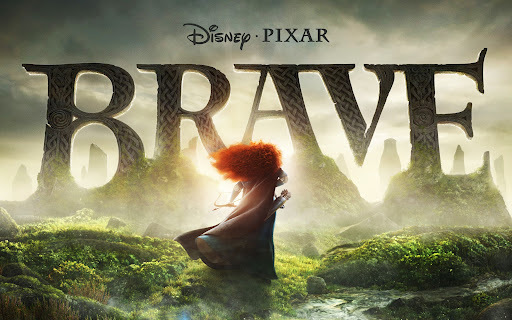 Brave was another outstanding movie from Pixar that I will be purchasing to go alongside my copies of Finding Nemo, Toy Story, and Wall-E. Merida’s journey of discovery is magical, exciting, funny, and heart-warming. I highly recommend this movie to people of all ages, but especially mothers and daughters who will be touched by the story’s conflict. First off, let me start by saying that I’m not someone who watches a lot of anime or reads a lot of manga. I have an awareness of it because of my students, but it’s a very surface level awareness. Some things I respect about Japanese animation is how they embrace characters of all ages, explore complex plots, and delve into human emotions. The plot is much more complex than your average animated show. It deals with issues such as prejudice, rebellion, and corruption. 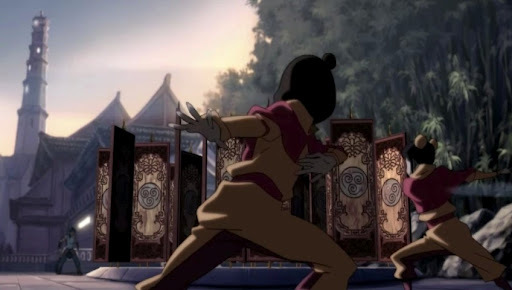 The premise of this series is that there is a revolution in Republic City that targets and threatens a certain population (benders) because the general people (non-benders) have long felt powerless and controlled. As the plot thickens, we learn new characters who are actually corrupt within the structure of the government and city. Sometimes I wonder how much of this show is going over the heads of a kid audience. 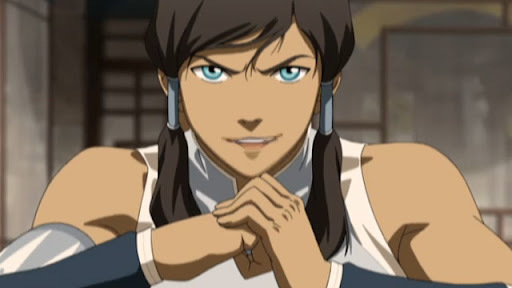 First, there’s Korra, the lead character. She’s strong, fiesty, and tough. She doesn’t let anyone tell her what to do, which sometimes causes her to make mistakes, but they are mistakes that she deals with herself. She’s the essence of a strong leading lady. 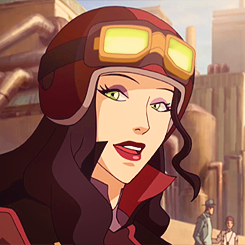 And wears fashionable leather outfits and takes off her helmet and shakes out her long, luxurious hair. And did I mention she’s drop dead gorgeous? 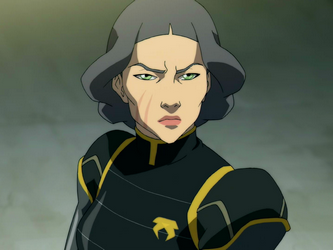 And finally there’s Lin Beifong. She’s the Chief of Police for the entire freaking city. The Chief of freaking Police. She can also fly through the air, knock people out, and see through the ground/walls. She is one tough chick with some serious integrity. 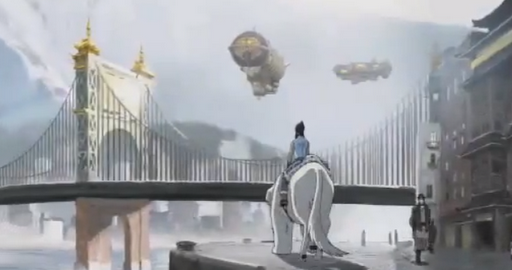 Oh wait, did I mention the series is steampunk? Yup. Airships, goggles, crazy gadgets, the whole deal. It gives the show this fantastic edge and freshness that is so much fun. If I did a good job and convinced you that you need to check this show out, some full episodes are currently streaming on Nick.com for free here. 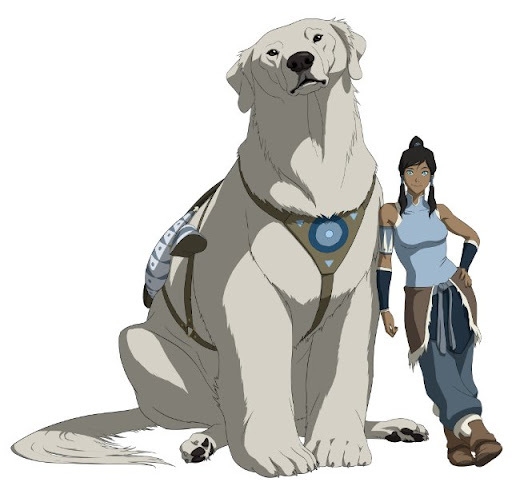 What is the Avatar? Why is the Avatar important? 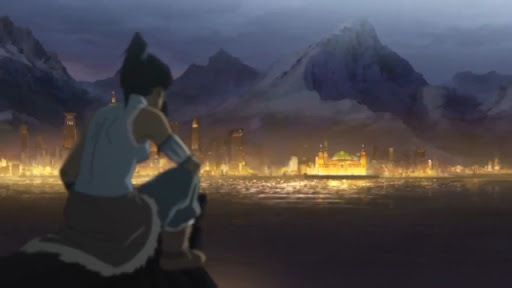 If you can answer those two questions, then you’re set to watch Legend of Korra and enjoy! This blog post is my attempt to awaken you to an issue, and to explain why it is so important that you see Brave on its Opening Weekend. Hollywood appeals to a male audience (even in animated films) because they assume guys won’t see films with female main characters whereas girls will watch anything. If you were to look at the cast of characters of animated movies made in the last 10 years and count the number of male characters versus female characters, the ratio (about 1:10) would be completely imbalanced and unrealistically heavy on male characters. The roles female characters do have in the story reinforce negative stereotypes in society for women: girls aren’t leaders, girls aren’t important enough to be main characters, girls don’t matter to the story, girls aren’t interesting, and girls aren’t funny. So here’s my plea. Pixar has made 12 feature films. This is the first movie Pixar has made with a female main character. Money sends a message to Hollywood, and Hollywood measures success based on a feature film’s opening weekend. Brave has a solid opening weekend (because it’s Pixar and Pixar has a solid reputation), but Brave does not make as much money as other Pixar movies have made in their opening weekends. This will send a message to Hollywood that having a female main character hurt sales and was a weakness of the film. Pixar is then hesitant to make more films with female main characters. Moms and Dads, girls and guys, show up on opening weekend to see Brave. Sales are high and equal to those of other Pixar films. Hollywood sees that the gender of the main character is not a weakness/strength, and Pixar is encouraged to make more movies with strong female characters in lead roles. This is why it is CRITICALLY important for all of us to support Brave in its opening weekend. Please, send a message to Hollywood that we like to see girls in movies just as much as we like our boys. And feel free to do your own post or link to my post to spread the word! Support Brave this weekend! *Sidenote* Japan doesn’t have the same gender issues as the US in their animated features. The ratio is far more balanced and frequently have female lead characters. I showed the movies Ponyo, Kiki’s Delivery, Spirited Away, and The Secret World of Arrietty (which all feature female main characters) to my majority male 11-12 year old students this year, and the kids LOVED them all. And my heart melted a little when the boys in one class were cheering for Arrietty as she scaled a curtain with hooks and proclaiming how strong and ‘epic’ she was. Boys WILL WATCH movies with girl characters.